1. Combine all ingredients into a cocktail shaker filled with ice. 3. 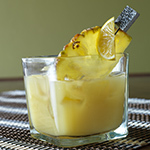 Pour into a martini glass and garnish with a lemon twist or pineapple.